Around 250 - Eurocave is absolutely rammed plus 36 in everyday wine rack. Having to put any purchases into reserves. About 150 at home and 400 in reserves inc some EP still to arrive. Mostly French with a few Italian. It’s hard to stop buying! 30 at home, total reserves 214 and 87 pending EP deliveries, of which a shocking amount is 2016 Rhone from TWS, Cru, Armit and L&W. Around 40% of them, with the rest in bond or lying abroad… the more I buy though, the lower that figure drops. 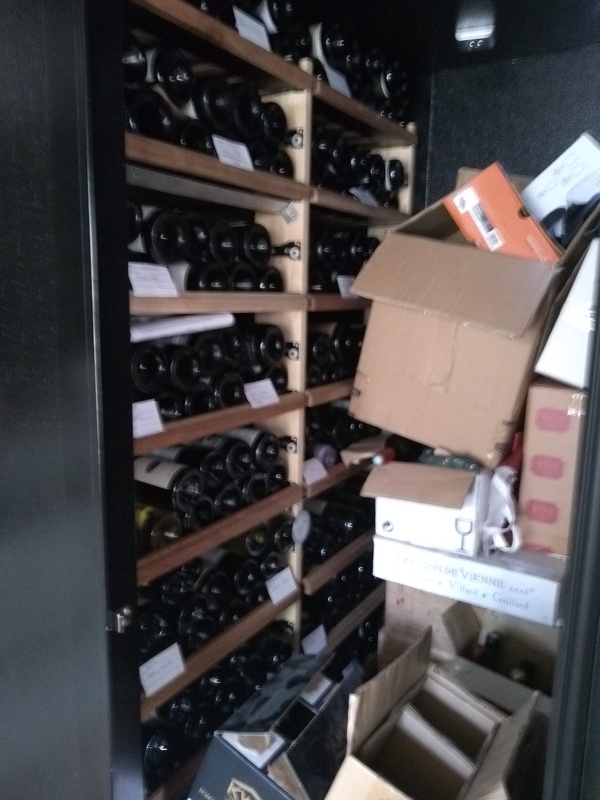 162 in the cabinets, plus about 30 to drink in the rack/wine cooler, about 8 cases from this year’s EP offers and another 12 coming from TWS next week. Oh and 6 on the way from a chateau in st.emilion. The problem is I only started collecting last summer when on holiday in right bank Bordeaux - if I carry on at this rate I’m going to have to move house soon! Hm and the balance is continually changing (in my head!) as well. Too many wines, but not enough “every day” bottles. Or so many many “special” wines but not the one I want right now. Or so many every day bottles, not enough of them red. Or lots of whites, but too much Chardonnay. I reckon I must have about 70 around the flat at the moment (including all of the above). My current view is that I need a few more bottles of Society label reds to have on hand for the odd weeknight bottle. I’m sure this view will change dramatically next time I pick up some fish to cook. I believe there is a similar affliction for those who are into clothes, best summised by the phrase: But I don’t have a THING to wear! I agree with that, usually when matching with food, its like: Hmm need a red to match with this dish, hmm maybe not that one, how about…nope not that one either sigh I guess I will just HAVE to open this one. We have about 80 bottles at home and 100 in our French apartment. I have 2-3 boxes of every day wines which we replace ad hoc so this could run down to just 6 bottles before we reorder. There are 2-3 boxes of wine maturing which we will open in a year or two. I find though you can get a glut of mature wine that needs drinking if you forget about it (I don’t use a tracker just have a browse from time to time). In France we buy a box on traveling out usually of good wine 1-2 years old and keep it 2-3 years before drinking. Problem is drinking the wine at a steady rate as it can suddenly run out if we have 8 of us staying for a week or so and the maturing system no longer works! In the end we have enough and the only worry is living long enough to consume it but perhaps not a bad inheritance. On our own it will take about a year of consumption (drinking every day) to consume all our wine but somehow it disappears much quicker usually when our kids at home with their friends and were out! Currently around 100 at home and 200 in reserves, plus about 40 or so bottles pending from EP orders. I certainly need to fill up the cabinet at home though in the near future - it’s becoming far too easy to find what I’m looking for! But do I fill from my reserves or from TWS Christmas offers and the fine & rare sale at the showroom next week??.. I also regularly suffer from @danchaq syndrome. The wine fridge has a nominal capacity of 500, but some judicious bulk stacking probably adds 20% and blocks access to half a dozen racks. Plus reserves and long on 2016 Rhone mainly TWS. Oh, and off to Alsace tasting as we speak. Only have 5/6 Alsace bottles, so bound to add a few more tonight. To be fair, it does look a little better now compared to earlier this year when the picture was taken. But my advice to anyone buying a wine storage unit of whatever size, buy judiciously and don’t try to fill it quickly. This reminds me of a previous house we had with a garage which housed four Eurocaves which was termed Stonehenge by one of my friends.